I was delighted to find this recipe in my Provençal cook book, as I had eaten a Lavender ice-cream in restaurant in Provence many years ago which was delicious. There they served it in a choux pastry puff with dark chocolate sauce and I have also served it that way. I altered the recipe by making a lavender caramel and then straining it as I didn’t like the fuzzy bits in my mouth! In the original recipe you made a praline and crushed it. 3 oz castor sugar & 2 tablespoons cold water Put in small pan with about 1/4 – 1/2 oz. lavender flowers. Dissolve sugar and then cook to a caramel. Add 1/2 pint milk to this, then stir until caramel dissolves in milk. Leave to infuse for 1/2 hour or so. Meanwhile beat 4 egg yolks with 2 oz. castor sugar until thick and creamy, then strain the lavender milk onto this. Heat slowly, to make a custard which will coat back of wooden spoon – don’t boil of course. Leave to cool. Whip 1/2 pint double cream lightly, then fold into the cold custard. Freeze. People always love this although they cannot always pin down the flavour. Hope you enjoy it. 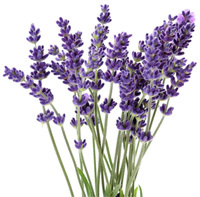 Dissolve sugar in water, with lavender flowers, and then cook to a caramel. Add milk to this, then stir until caramel dissolves in milk. Leave to infuse for 1/2 hour or so. Meanwhile egg yolks with castor sugar until thick and creamy, then strain the lavender milk onto this. Heat slowly, to make a custard which will coat back of wooden spoon – don’t boil of course. Leave to cool. Whip heavy cream lightly, then fold into the cold custard. Freeze. People always love this although they cannot always pin down the flavour.